Jason Bateman goes to the darkest places of his illustrious career in Netflix's Ozark. The famed funnyman leaves comedy behind in a twisted tale of money laundering, drugs, and murder. Created by Bill Dubuque (The Accountant, The Judge) and Mark Williams, Ozark is a ten episode crime drama that takes place primarily in backwoods Missouri. Bateman is not only the lead actor. He executive produced and directed four episodes, including the riveting pilot. The opener is a doozy, gripping and violent. It far exceeded my expectations and sets the series off with a bang. Marty (Jason Bateman) and Wendy (Laura Linney) Byrd seem to have an idyllic life. Married for twenty-two years, he's a wealthy financial advisor with a quiet disposition. She's a stay at home mom; caring for rambunctious teenager Charlotte (Sofia Hublitz) and clever Jonah (Skylar Gaertner). They live in the beautiful Chicago suburbs. They are the picture of a happy family, but it all is an elaborate lie. The truth is that Marty and his business partner launder money for a Mexican drug cartel. They've been doing a brilliant job for years, but the jig is up. Seven million dollars has been stolen. Del (Esai Morales), the cartel boss, decides to pay his brokers a visit. The consequences are bloody and brutal. Marty must take quick action to save himself and his family. What started as an idea for a family vacation becomes his only recourse. He must leave Chicago immediately, relocate to the untapped drug market of the Ozarks, and repay the money plus interest. Unfortunately for Marty, Wendy has been hiding a big secret as well. Marty and Wendy must quickly come to terms with each other. Their marriage has covered up a web of deep lies that are now in the open. With the cartel threatening, the couple must act for the safety of their children. Del will kill them all, the kids first to make a point. The Chicago family facade has been shattered. The family leaves in a whirlwind to Missouri. Their children are deeply suspicious of the quick move. Marty and Wendy have no idea what awaits them, but Del must be repaid. Their lives depend on it. I spoke with stars Jason Bateman and Laura Linney at the Ozark press event. Bateman had worked with Netflix previously when the streaming service picked up Arrested Development. He'll begin shooting the new season of that show in August. He and Laura Linney had nothing but high praise for Netflix. They allowed Bateman to follow through on his vision for Ozark. He was blown away by Bill Dubuque's scripts and signed on wholeheartedly. He jumped at the chance to play a character unlike anything he's done before. 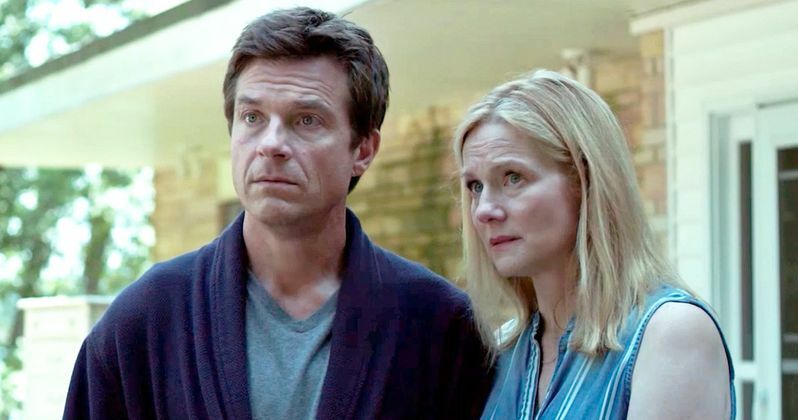 While Laura Linney has had a more multi-faceted career, this dark turn for Jason Bateman will be new for audiences. I am pleased to report that he's amazing, as both the lead actor and director. Ozark's ten episode season premieres in full, June 21st on Netflix. Please see below our exclusive video interview with Jason Bateman and Laura Linney.